How is your February going? I can’t believe it’s almost over. Seeing all the Easter stuff everywhere is freaking me out. This baby boy is due 5 days afterward and I’m not ready!! Not that I have a list of things to do or anything. If I did, it would be stuff like, “Sleep now or forever hold your peace,” or “Grow up,” or “Stop getting mad at your toddler when she throws her food at the wall because pretty soon you’re going to have two of them to deal with.” Wish me luck. 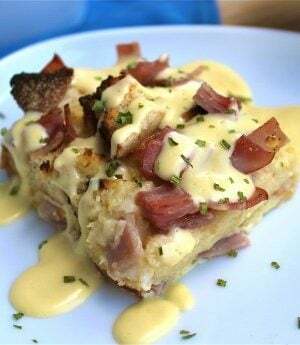 This is another great recipe from Eric’s mom. She claimed last week that 25% of the recipes on this site are from her, which I heatedly contested. But she’s really not that far off. She’s a great cook, what can I say. 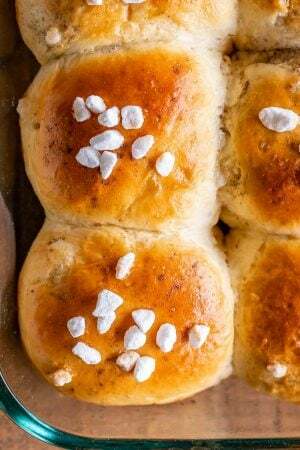 This recipe is a family classic. When we first started dating, Eric thought it was so weird that I used store-bought maple syrup on my pancakes. I had to gently inform him that no, most people don’t make their own syrup, they buy it for a dollar and a half at the store. But he’s got me converted. I prefer this recipe to the store-stuff now. Just a heads up, this recipe is much thinner than the syrup you’re used to. The store stuff is basically corn syrup with some flavoring and cellulose gum, whatever that is (it makes me think of cellulite, which is not exactly appetizing). This recipe is meant to be made ahead of time, and it does thicken up as it cools, but I always eat it immediately anyway. The flavor is delicious and I promise you won’t miss the cellulose gum. Enjoy your pancakes and waffles and French toast! Combine both sugars and water in a small saucepan and bring to a boil. Let it boil for about a minute or two, stirring occasionally. Remove from heat and let cool for 2 or 3 minutes. 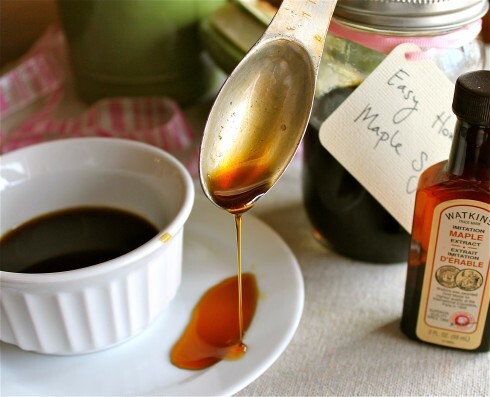 Add maple extract. Let cool completely; the syrup will be thicker the colder it is. Store in the fridge for up to…forever, as far as I know. We’ve never had ours go bad, but then again it usually doesn’t last that long. I have a similar recipe that was used to fill Mrs. Butterworth bottle and the kids never knew the difference. But my recipe would have 1/2 c. of corn syrup, just to add a little more sugar. Give it a try. Vanilla is also an alternative flavoring to maple. Haha I love that you fooled your kids with the Butterworth bottle!! I’ve never tried it with corn syrup but that’s a great idea. Thanks for the tip, I will try it! 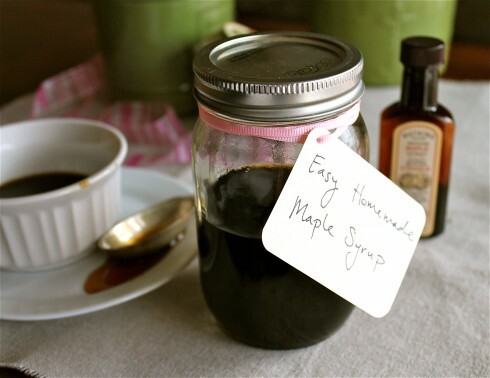 Homemade maple syrup???? Who knew??? I can’t wait to try this! Thanks for the trip down “Memory Lane” today as I’ve scrolled through your waffle recipe blog and this one! And although its not Karen’s favorite, you can use any type of extract (Almond, Vanilla, etc.) depending on the flavor you like. Awesome! Let me know how you like it Amy!